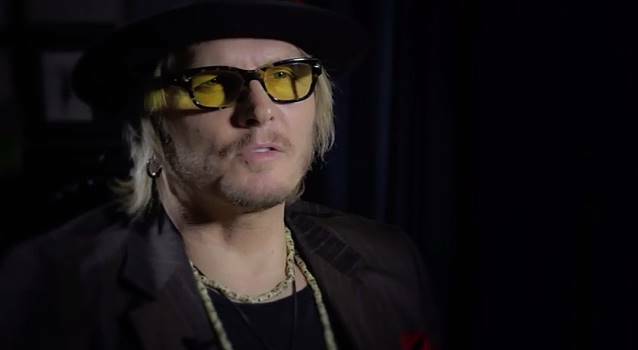 Drummer Matt Sorum has refused to comment on reports that he will sit out GUNS N' ROSES' reunion at the Coachella Music And Arts Festival. Sorum was asked by TMZ about his involvement with GN'R's return while arriving at the Los Angeles airport with his wife, Adriane "Ace" Harper. You can watch his reaction below. GUNS N' ROSES issued a press release on Tuesday confirming that Slash and bassist Duff McKagan will rejoin singer Axl Rose for the band's upcoming performances at this year's Coachella Music And Arts Festival. There is still no word on whether original guitarist Izzy Stradlin, drummer Steven Adler will appear, along with any other past or current members of the group. Reports have suggested that current drummer Frank Ferrer, guitarist Richard Fortus, multi-instrumentalist Chris Pitman and keyboardist Dizzy Reed and will round out the lineup. The 2016 Coachella festival will take place on the weekends of April 15 through April 17 and April 22 through April 24 at the Empire Polo Club in Indio, California. GUNS will play on April 16 and April 23. There are rumors that the band will head out on a 25-date North American stadium tour this summer, but so far there is no official confirmation of that.